Hand made paper, silk organza, ink and graphite, machine stitched, 40 X 40 inches. Vintage sheet music, ink on tissue, graphite, hand made paper, silk organza, machine stitched, 36 X 36 inches. 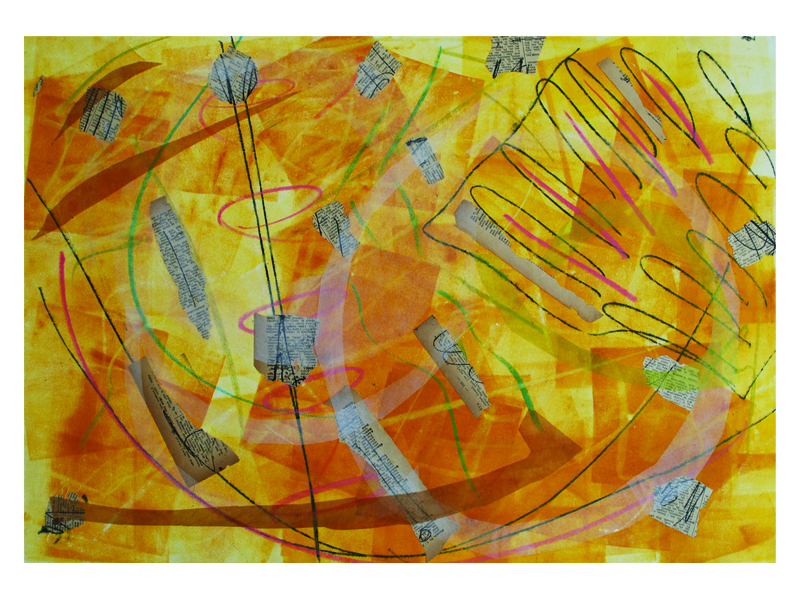 Ink, silk, stitching on Arches paper, 39 X 37 inches (diptych). 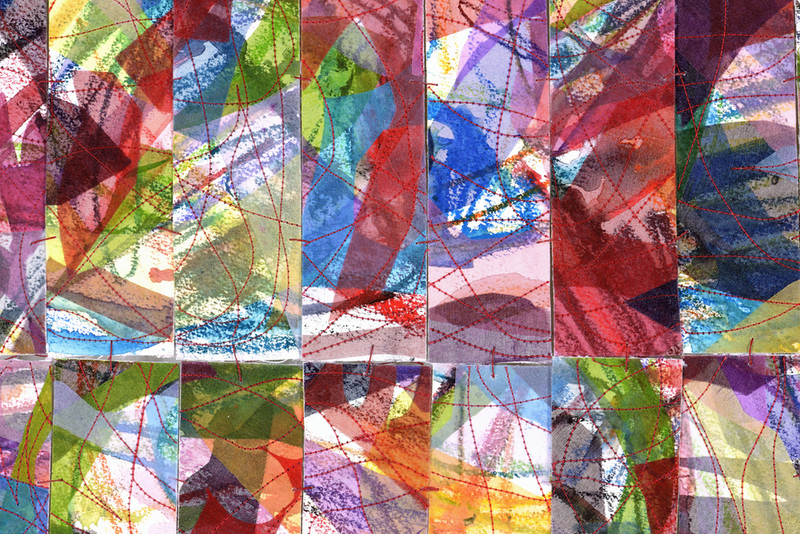 Detail: Ink, silk, stitching on Arches paper, 39 X 37 inches (diptych). Ink, silk, vintage dictionary pages on Arches paper, 24 X 16 inches each (5 panels in total). Detail: Ink, silk, vintage dictionary pages on Arches paper, 24 X 16 inches each (5 panels in total). Acrylic on cotton and linen, crayon, stitched, 55 X 57 inches. 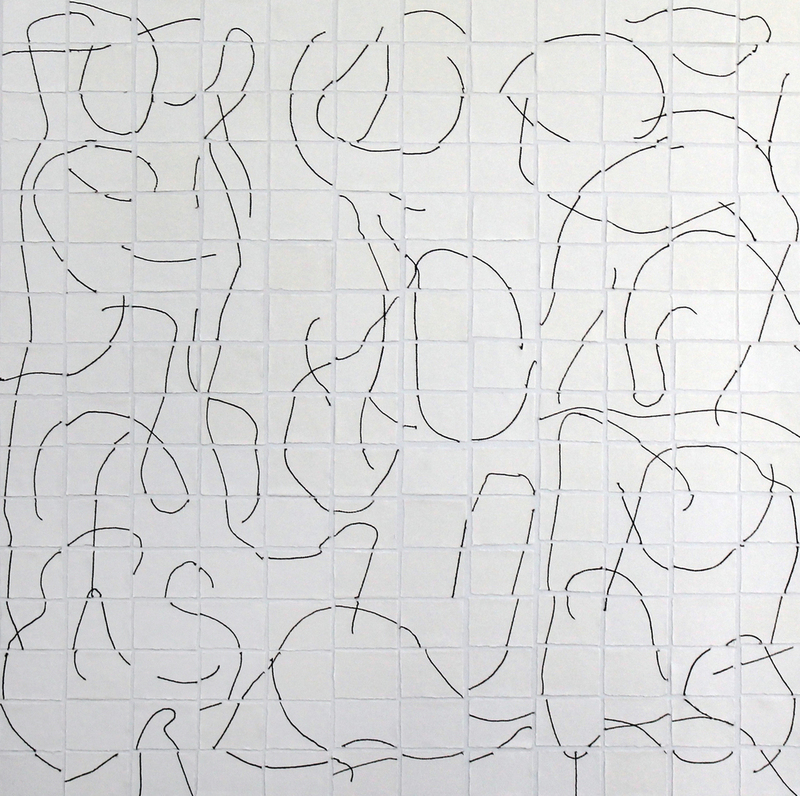 Silk organza, drawings on paper, machine & hand stitched, 63 x 42.5 inches. 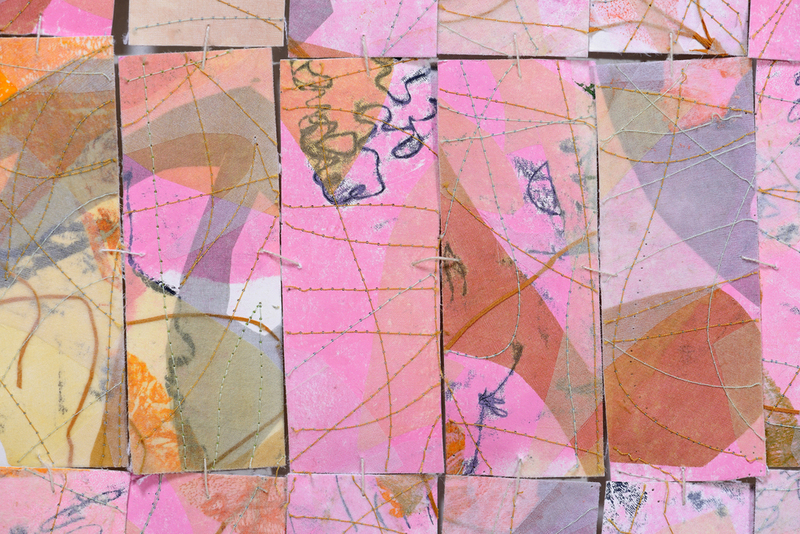 Detail: Silk organza, drawings on paper, machine & hand stitched, 63 x 42.5 inches. Oil on tissue, handmade papers, vintage books, silk, ink, paper thread, machine & hand stitched on paper, 68 x 42 inches. Detail: Oil on tissue, handmade papers, vintage books, silk, ink, paper thread, machine & hand stitched on paper, 68 x 42 inches. Vintage maps, silk organza, machine & hand stitched, paper/linen backing, 48 x 48 inches. Detail: Vintage maps, silk organza, machine & hand stitched, paper/linen backing, 48 x 48 inches. Nautical maps of New England, hand dyed silk organza, machine & hand stitched, on paper/linen backing, 48 x 48 inches. Detail: Nautical maps of New England, hand dyed silk organza, machine & hand stitched, on paper/linen backing, 48 x 48 inches. Oil on tissue, vintage books, silk, wax pastels, machine & hand stitched on paper, 69 x 41 inches. Detail: Oil on tissue, vintage books, silk, wax pastels, machine & hand stitched on paper, 69 x 41 inches. Arches paper, vintage papers, line transfer drawings, pierced, machine stitched, 45 x 45 inches. Detail: Arches paper, vintage papers, line transfer drawings, pierced, machine stitched, 45 x 45 inches. Handmade cotton paper (Dieu Donne), machine stitched, mounted on canvas stretcher, 48 x 36 inches. Handmade cotton paper (Dieu Donne), machine stitched, 70 x 46 inches. Detail: Handmade cotton paper (Dieu Donne), machine stitched, 70 x 46 inches. Handmade cotton paper, machine stitched, mounted on canvas, 48 x 48 inches. Machine stitched papers, silk, on linen backing, 44 x 43 inches. Machine & handmade paper collage, 50 x 33 inches. Oil on paper, vintage sheet music, 48 x 32 inches. Oil on paper, vintage sheet music, 32 x 26 inches. 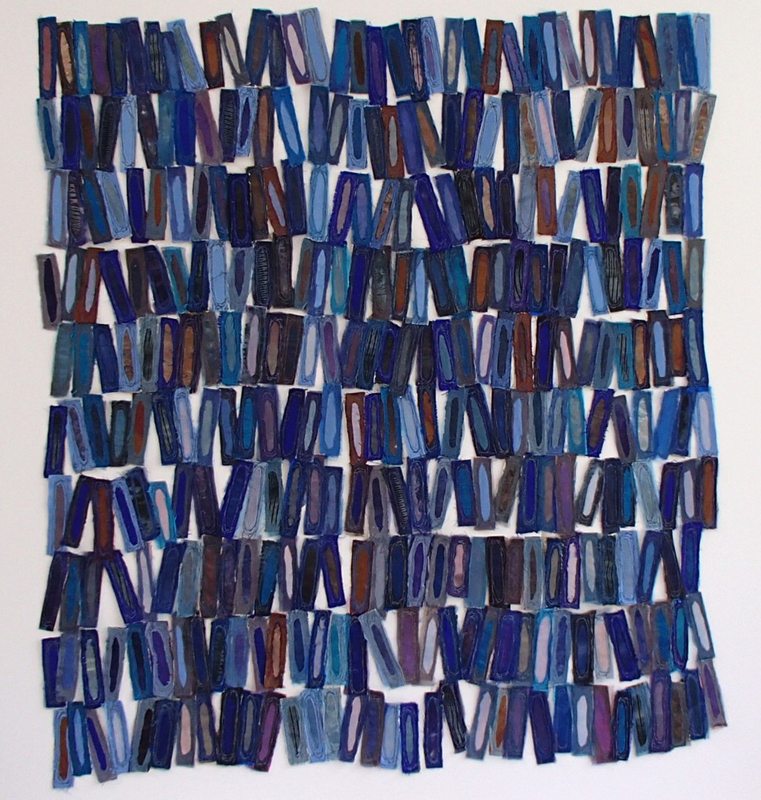 Silk on handmade paper, machine stitched, 38 x 36 inches. Stitched cotton & linen, acrylic paint, 55 x 54 inches. Gesso, pigment, gold leaf, tissue on cotton, hand stitched, 28 x 28 inches. Vintage French dictionary pages, handmade paper, silk organza, drawings on paper, machine stitched, on four panels, 72 x 3 inches (each). Detail: Vintage French dictionary pages, handmade paper, silk organza, drawings on paper, machine stitched, on four panels, 72 x 3 inches (each). Handmade paper (Dieu Donne), vintage French /English dictionary pages, Chateau du Pin wine labels, on two panels, 30 x 36 inches (each). Detail: Handmade paper (Dieu Donne), vintage French /English dictionary pages, Chateau du Pin wine labels, on two panels, 30 x 36 inches (each).